This is kind of strange! Back in 2013, Japanese pop star Minami Minegishi suddenly appeared in a YouTube video with her head shaved, sobbing and apologizing. Minegishi is a member of AKB48, one of Japan’s most popular girl groups, and this video was uploaded to AKB48’s official YouTube channel. It racked up millions of views before being widely criticized and set to private. What sparked all this? Minegishi was rumored to have a boyfriend, which is a no-no for idols like Minegishi. The incident (more here) made international news. She’s continued her successful singing and TV career and has even poked fun at this whole thing. But now, for some reason, photos from the infamous clip are being spotted in Europe. 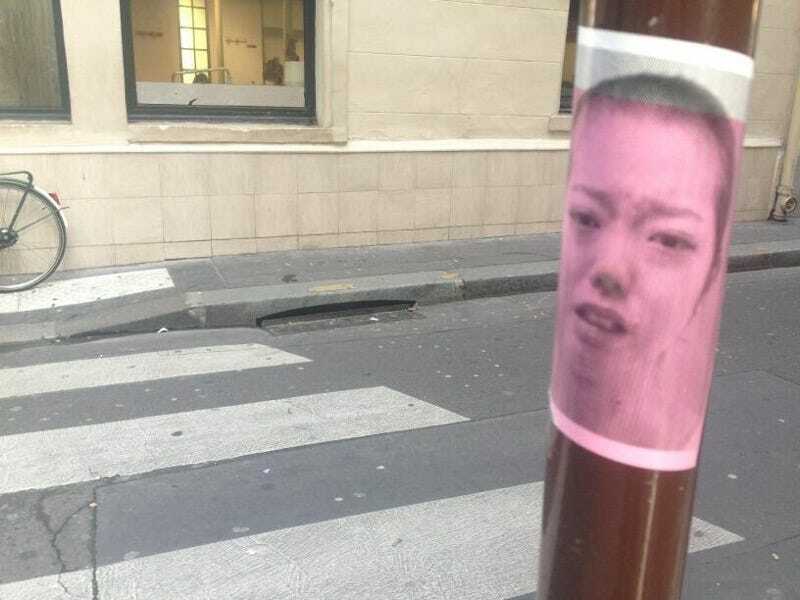 Recently, Twitter user ajapermaho noticed bald-headed Minegishi photos plastered on a Paris street near a Japanese restaurant. These photos have been retweeted over 20,000 times. Many Japanese Twitter users thought it was very odd to see this on a Paris street. It is! Or is it? Here’s where things get stranger. Another Twitter user replied to Ajapermaho, uploading another bald Minegishi photo. This one, however, was apparently taken in Sarajevo. Another person replied, with a bald Minegishi photo supposedly plastered in Germany. As noted on Byokan Sunday, there are a bunch of theories floating around. Maybe, the image is supposed to be insulting? Or critical? Maybe it’s an art project? Maybe it’s some kind of cult? Doubt that last one, but who knows!